Artisanally grown Strawberry Myrtle in the Santa Lucia foothills. Two Lands Farm is a bootstrap business built around a love for Strawberry Myrtle and a desire to hold on to a familial heritage shared between two countries - and two backlots on the periphery of the Salinas Valley. An aromatic berry with a vibrant flavor and healthful character. 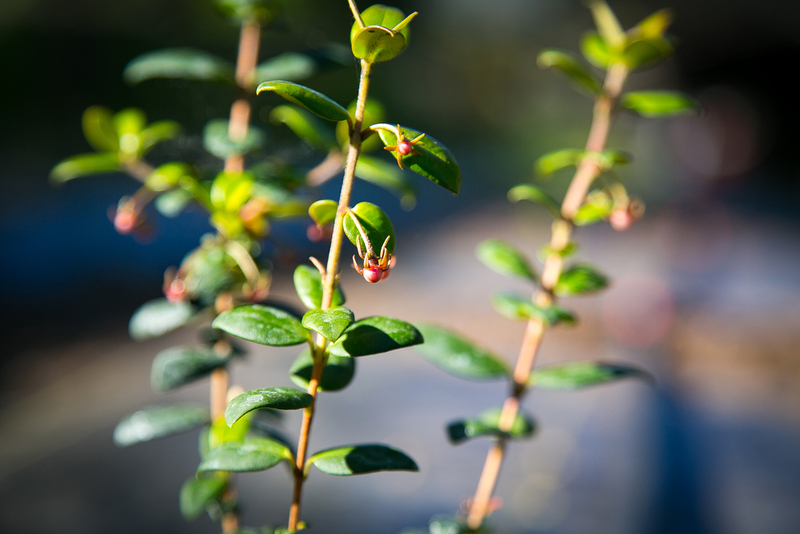 Strawberry Myrtle is an evergreen shrub that grows wild in the eastern side of the costal range mountains of Chile. Its fruit is of great aroma and flavor. The fruit is used in diverse ways, including jams, infusions, liquours and pastries. In addition to it's many culinary uses, the plant has many nutritional and medicinal properties. The seed contains a high degree of unsaturated fatty acids and their high content of linoleic acid (78.7 %), enhances their potential as edible oil. Linoleic acid , also important constituent of the fruit and myrtle leaves, is an essential nutrient in prostaglandin synthesis, generation of cell membranes, defense mechanisms and tissue regeneration. Very similar growing areas exist in the eastern side of the Santa Lucia Mountains of Central California. It is here, on two small plots of lands, where the first commercially grown plants in California are being nurtured to maturity by horticulturist Lina Valenzuela. The first crop is expected by the autumn of 2018! Folks interested in the experience of tasting this charming, little berry are encouraged to add themselves to our mailing list. You'll receive occasional updates regarding our Strawberry Myrtle crop and our various other specialty crops. Please consider following the Two Lands Farm blog for more regular updates, lessons learned, and strawberry myrtle based jokes. We are currently growing exotic peppers from Chile and around the world as part of our smoked pepper trials. We hope to have a variety of smoked pepper spice blends in the near future!